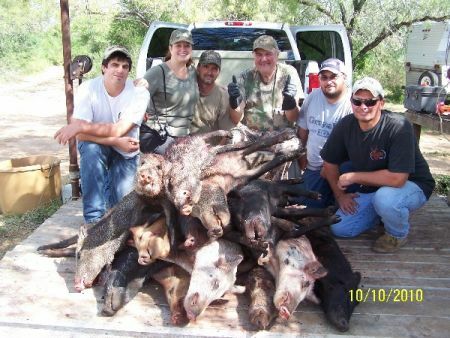 Deer, hogs,javalina, turkey,doves, rattlesnakes and rabbits. Size of hog in response to a report titled: Size of Hot? 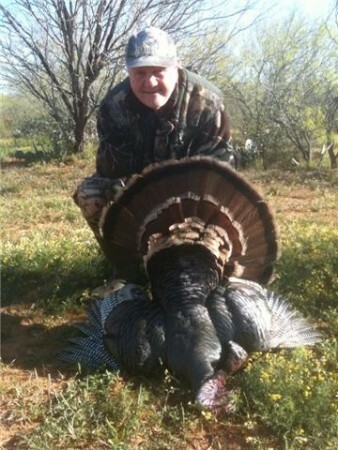 We set up on this bird 3/22/10, on our ranch lease in Zavala county Texas at 8:30AM. He gobbled once when we first got there and he sounded like he was far away. We continued to call with a box call about every 5 minutes. After about 30 minutes, the bird gobbled the 2nd time and he sounded a lot closer. I got ready. After another 15 minutes, the gobbler stepped out on the sendero about 70 yards away. He looked in our direction and when he saw the decoy, he immediately went into a strut and started walking in our direction. With the morning sun shining on him, his irridescent plumage was sparkling in the sunlight. He looked magnificent. He strutted in within 3 feet of the decoy and slowly turned to his left and took about three steps. My videographer Steve Alleman, made a couple of soft yelps with his mouth call. The turkey stuck his head out and Steve said take him. I hesitated a few seconds hoping the turkey would gobble. When he didn't, I pulled the trigger and dropped him at 23 yards. This was one of the most exciting hunting experiences of my life. He weighed 23 pounds, beard 8/1/2 inches and spurs 1 inch. We set up on this turkey at 8:30 AM on 3/22/10. My buddy Steve Allemand from Katy Texas was doing the calling and the video. We heard the bird gobble a long way off. Steve continued to yelp with his box call. The 2nd time the bird gobbled, he sounded much closer and Steve said get ready he's coming. When the turkey stepped out on the sendero about 70 yards away, he went into a full strut as soon as he saw the decoy. As he proceeded toward the decoy, he looked magnificent as that bright Texas sun glowed on the irridescent colors of his feathers. As he strutted toward the decoy, I got ready. He walked up within 3 feet of the decoy and when he turned to his left away from the decoy, Steve softly yelped with his mouth call. When the bird stuck his head out, Steve said take him!! I hesitated about 4 seconds hoping he would gobble. When he didn't gobble, I pulled the trigger and he dropped in his tracks. This was a fantastic hunt and the first gobbler for me in 25 years. A comment titled: Size of hog in response to a report titled: Size of Hot? That hog should be close to 300#'s. Better use the 308 right behind the ear.